Theres something about Up North Michigan that just makes us feel amazing! Whether you're a Michigan native or visiting, the towns are really worth spending some time at. We usually make a trip once a year somewhere up there and this summer we decided to head back to Charlevoix and it was the PERFECT weekend getaway! With the end of summer finally here we wanted to share with you our up north getaway. Charlevoix has a special meaning to us - it feels like home for so many reasons but its a stepping stone to how we ended up meeting so we love visiting there and the last time we were there was FIVE years ago! So we were well overdue for a visit! We also stayed at some super unique properties and had the best time immersing ourselves into the Up North culture for the short time we were there! 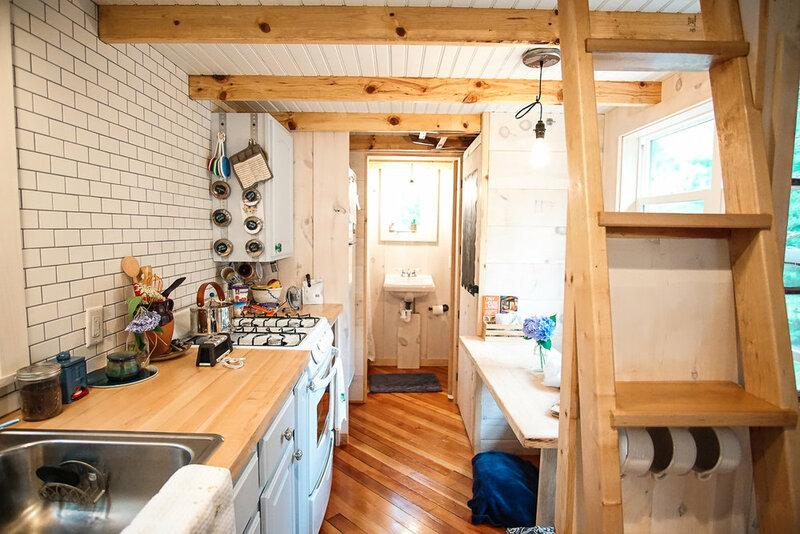 Be sure to check out our reviews for both The Mushroom House & CVX Tiny House if you're looking for a great place to stay when visiting there! We headed up for a long weekend this summer but you could totally do this same trip in the fall as well - we're thinking about it! ;) Its a place to disconnect and just be in the moment which is exactly what we did. Theres just something special about the cute town that makes you feel that you went back in time. Everyone is so friendly and it truly feels like a quintessential american town. We were lucky enough to visit during the Venetian Festival, which gives the town a whole different vibe! There's bands, food trucks, events going on in the closed off part of downtown, fireworks and a parade! First we settled into our chalet at the Mushroom House properties. It was like being transported to another world! Somehow in the middle of Charlevoix you don't feel like you are there anymore, it was truly magical! I don't want to get into too much detail because it deserves its own post so go read it here! After settling in we headed over to Castle Farms for a great Farm to Table dinner prepared by Grey Gables - a incredibly well known restaurant in downtown. A very cool atmosphere of the castle, great food & awesome live music was the perfect first night there! The next day we got up early for a run and some matcha lattes before heading over to That French Place for the MOST AMAZING crepes! Now I'm not into sweet crepes and somehow got J to be ok with getting a savory one so if you're wanting to try one out we suggest the Spinach & Mushroom - its so good we got it two days in a row ;) Afterwards we headed over to the farmers market to check out all the local goods! The Charlevoix Farmers Market was there for two days and we got to get the most amazing cherries, granola & lavender goodies from there! Later on in the day we headed over to Lavender Hill Farm, which was our favorite part of the trip! If you get a chance to stop there you have to! We wandered around the different lavender fields and the grabbed some lavender soda (the perfect cool down!) and ice cream in the little shop. We plopped down on the purple lawn chairs and took in the view on this perfect summer day! The best thing about NoMich - Northern Michigan for all you non-natives ;) - is you can just drive and be completly surrounded by gorgeous scenery! So we drove and drove and found this spot that over looked Lake Michigan that we ended up going back to the next night as well. Afterwards, we checked into our second place, a tiny house Airbnb rental. 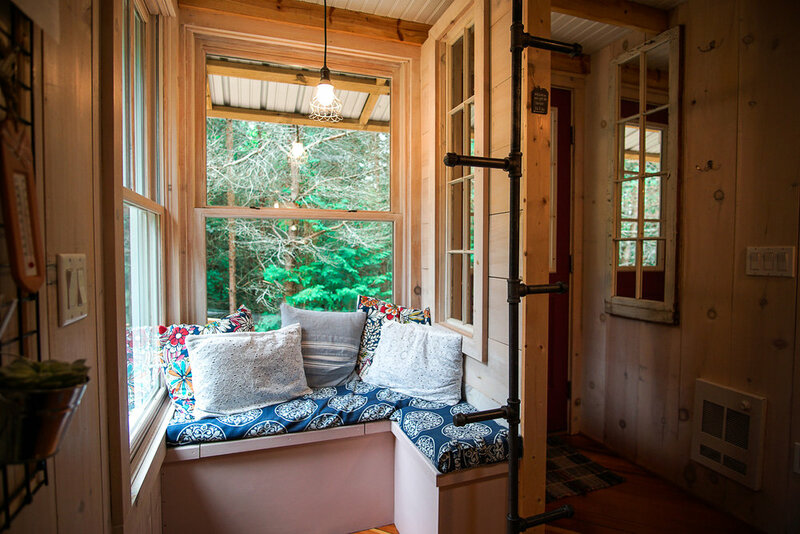 You have no idea how excited we were to stay in one - plus its the perfect setup to seeing if you can actually handle that small of a space and each other ;) I'll let you in on the end result, yes we could and you become VERY close! It was such a fun experience which you can read more about here! For dinner we took another little drive over to Petoskey, another favorite town of ours! Whenever we are in Charlevoix we also love to head over to Petoskey because they have the cutest shops and restaurants! Chandler's is such a fun spot to grab drinks or dinner. It has an outside patio tucked into a little alleyway - if you get the chance to sit outside take it. The atmosphere is so charming! After dinner we just walked around to catch the sunset which is always beautiful up there. This was our last full day and we beached it almost all day long. It was so nice to just read on the beach together and relax. Our favorite beach is Michigan Beach Park but get there early to get a good spot - it gets pretty crowded quickly! They also have THE best burgers but that may be just to us because they are our favorite! After beaching we biked all around Charlevoix which is so much fun :) For dinner we headed over to Grey Gables and we always want to be honest with you guys, even though it wasn't our best meal its a very cute place that has been in Charlevoix forever so its worth the stop. Afterward we went to our little secret spot to watch the sunset and sip on some gin & tonics - the perfect ending to our NoMich weekend getaway!